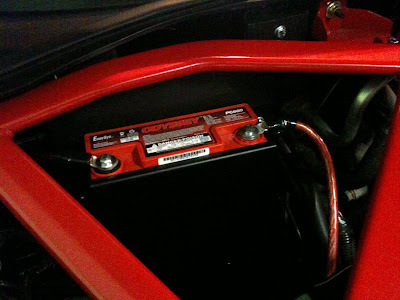 We mounted the Odyssey PC-680 battery when in down time from the other projects going on. This became a bit of a pain at times as there was no real DIY written up for this surprisingly. I have seen many similar "builds" to this, but no real writeup. Looks like I'll be changing that here! 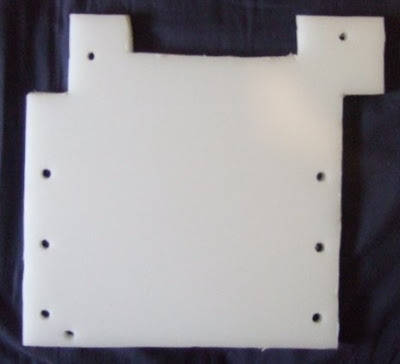 Below is a picture of the measurements needed for the firewall mount, which is what your battery mount will mount to. It's pretty straight forward. We used a half inch thick cutting board we picked up from Shaws, got the biggest size we could get. Cut the plastic cutting board with the dremel with the following measurements. The opening I cut at the top is because of the strut bar I have. Measure where you want your battery mount to be and bolt up to the plastic board and drill your holes accordingly. Oleg decided to try out T Nuts for the backing of the plastic and that idea worked out great for us. I also spray painted the mount black after I was done just to clean it up a bit. Didn't want to go into too much details on the DIY with this one as we had to feel out a lot of the steps we did and I have a feeling someone out there can maybe do better with just the pictures and comments I have listed here. Pretty straight forward for the most part though, just time consuming.